It’s been so busy lately, I can barely tell my arse from my face. Thankfully I work in public relations, which means I can take a mid-week break to drink a glass of bubbly (or two). Tonight, I’m off to some property party. Smug in the knowledge that a pot full of chilled payesh or rice pudding will be waiting for me back home in the fridge. I cooked it two days ago, and then realised that I wouldn’t be able to wear the dress I had in mind if I ate too much of it. Normally, I forgo cooking sweet things in favour of savoury dishes. But I was really craving this creamy, spiced desert. As I am now. Frankly, I’d just rather go home. But after all the effort it would be a shame to waste the dress. Mix the rice with the ghee. In a small pot, bring the milk to a gentle boil with the bay leaf and cinnamon. As it starts bubbling slowly, add the rice, four tablespoons sugar and evaporated milk. Continue to boil gently until the rice is cooked and the milk thickens. Finally, stir in the raisins and leave to cool. Serve this chilled in little bowls. It’s also delicious served warm alongside parathas. LOL!! Nice description of how busy you are!! Love how thick and creamy it is, yum! My kids prefer Vanilla flavored rice pudding. I add Sago /Tapioca too sometimes. Yum, love all varieties of rice pudding. How is payesh similar to/different from kheer (not sure of spelling)? I love kheer, which is a staple of Indian buffets I’ve frequented. I never thought to make it myself! Love your blog. 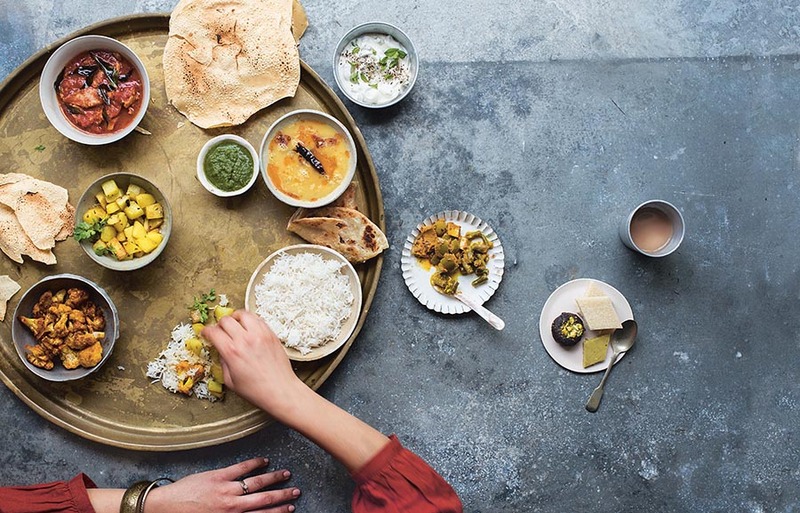 Our Indian restaurant in town closed–can’t wait to make some of these dishes! Never knew one could be that busy, Mallika, LOL! And foremost I loved the simplicity this dish carries…. Wow, now I want to see the dress! Payesh is looking good, now you’ve got me craving this. Malika, Once you open a tin of ghee, how long does it last in the fridge? 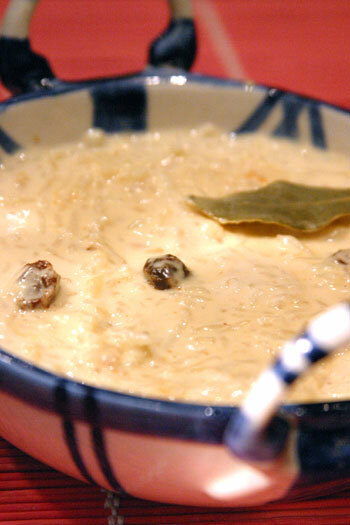 Hi Gina – Kheer has nuts and sometimes saffron in it. It’s a lot richer. Sandepa – I’d love to get gur but it’s not available around London. Maybe I’ll take a tip from my mom and bring a suitcase full back when I am in Calcutta next! Planethalder – No need to refridgerate ghee. It’s very refined butter so it’ll last forever in the kitchen cupboard. I love warm rice pudding. It’s the ultimate comfort food. Radman – your comments always make me laugh. My sister is single BTW. I knew I could depend on you for a kheer recipe that doesn’t involve hours of continuous stirring. What size tin of evap do you use? No time for stirring on my end! I used a 410 gm of Tesco evaporated milk. If you use cheap, quick cook rice you’ll cut stirring time even more. Enjoy! Is evaporated milk – skimmed milk powder or condensed milk? sorry . I am a little confused. Thanks Mallika for the link and the explanation. however, i havent seen tinned evaporated milk in Kolkata (where I am from originally) and Mumbai (where I live now) Only seen Amulya skimmed milk and fresh milk, Milkmaid condensed milk. If I am not mistaken, Bengalis make payesh with fresh milk and gur to sweeten it. how many ml or litres is a pint of milk ? Hey mallika….that was an amazing and easy recipe. But I realized (through my mom) that uncooked rice should never be added before sugar as it takes really really long to cook. Sugar should be added after rice has been cooked. Is Payesh a lot like Kheer in the consistency or is creamier? it looks a lot creamier and yummier in the picture, Mom makes Kheer a lot but i havent tasted payesh yet, but there was something about this dessert in ‘The Namesake’ that made me look it up.